Now that you know how to set up Windows 7 updates, it is time to walk through the process of installing them. This is also an essential part to getting the most out of Microsoft updates for Windows 7. There are two ways to update Windows 7: Automatically and manually. Automatic updates allow the computer to do the work for you. When new updates are detected, Windows will download them and have them ready for you to install. You learned in the last post on setting up Windows 7 updates that you can set aside a time of the day to install these updates, too. If you do not want to rely on your computer to install Windows 7 updates, you can also update manually. This means that you will have to sift through the updates, download them and install them yourself. This can be more time consuming than automatic updates but it gives you more control over when updates are installed on your computer. We will go over how to install updates both ways and you can make the decision on how to update Windows 7. There are two ways to set up automatic updates: They can download and install automatically or they can download and wait for you to install them. Most users prefer the latter as it gives them more control over when updates install instead of leaving a computer on to get it done. When you download and install updates automatically, you set a time of the day for them to install. They will download and then wait to install until that set time. This means your computer must be on at the time you set or else it will not install the updates. If the computer is not on, you will have to install them manually or wait until the computer is on again at the set time. Microsoft recommends this option for the majority of Windows 7 users. 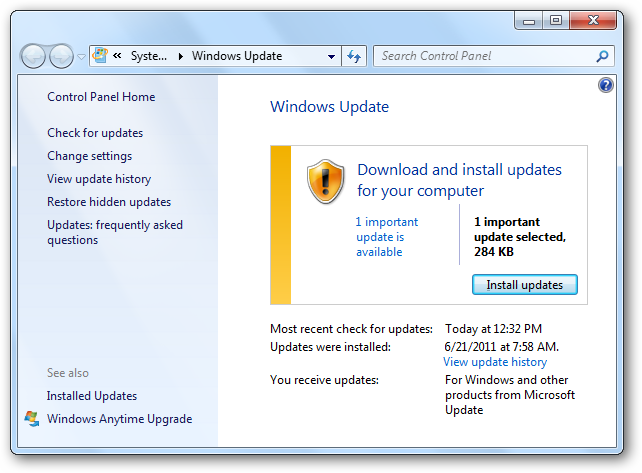 Windows 7 updates will download when available and a pop-up will alert you they are ready to install. If you click on the pop-up or tray icon, you will open up Windows Update. It will let you know how many updates need to be installed and give you the option to install them. At the moment, I have one Windows Update that needs to be installed. If you click on “Install updates,” it will begin the installation process. It will then alert you that the update is installing and give you a progress bar to watch. When installing Windows 7 updates, you want to make sure you are not doing anything else that takes up system resources. This can make the update install much slower and some updates will conflict with what you are doing which will stop the update. When the update is finished, Windows will alert you that it has been successfully installed. If you are required to restart your computer, Windows Update will let you know. It is safer to restart your computer than wait to do it later if you have the time. If you want to manually update Windows 7, you can change the settings under the Windows Update “Settings” options in the Control Panel. Once set up, you will have to be vigilant to check for Windows Updates. This needs to be done at least once a week if not more to make sure you are not missing out on necessary updates. If you time Windows Updates with updating your anti-virus software, this can be a good way to go about keeping your computer safe and running on all fronts. 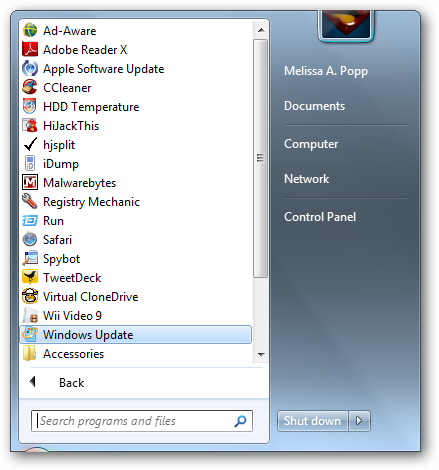 In order to update Windows 7 manually, click on your “Start Menu” and then “All Programs.” Windows Updates will be one of the options above your program folders. This is setup by default when installing Windows 7 on any computer. You can choose to move that Windows Update link to your desktop, task tray or anywhere else you want for easy access. This will open Windows Update panel for you. It may say you have no Windows Updates if nothing is available to download and install. If you have Windows Updates available, it will let you know that you must download then install them on your system. Click “Install updates” and Windows 7 will begin the download process. Once the update is downloaded, it will start the installation process which will follow the same steps as it does when automatic updates are setup. Conclusion – Which way of updating is the best? Regardless of how your update Windows 7, you must update it regularly. That can never be stressed enough by those of us writing about it or Microsoft. Automatic updates give you the freedom to continue working on your computer and not having to worry about updating at all. It also gives you the freedom to have updates waiting for you to choose to install but without waiting for them to download. 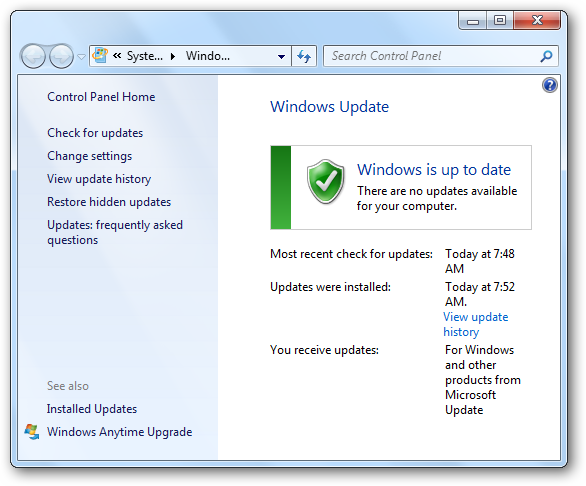 Manual updates gives you total control over when and how you update Windows 7. Depending on what type of control you have, one way of updating may be better suited for you. Neither one is better than the other, because you have to update Windows 7 no matter which way you go about it to keep your computer running smoothly.